Bowdle, South Dakota is struck by a large wedge EF4 tornado. Damage to structures was minimal but transmission lines and farm equipment are easily destroyed. A tornado would churn near Bowdle, South Dakota on this day, but conditions weren't appearing so favorable earlier on. A strong cap had entrenched across the region and we weren't sure if storms would form before nightfall to see anything significant. We checked out of the hotel room with other storm chasers and felt a strong southerly flow along with the fresh smell of gulf moisture as we walked out of the door. Our destination was central South Dakota to travel along Interstate 90 and take highway 83 to Pierre, South Dakota. The time was 3:00 p.m. and we stopped at a local gas station to grab some food, fuel up and analyze the weather data for a final time. 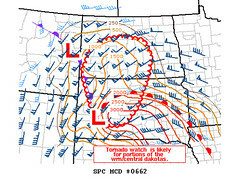 It appeared the best potential for severe weather was going to be across northern South Dakota near the Missouri River. As left Pierre, Shannon and I continued northeast on highway 83 and saw the first signs of towering cumulus clouds towards the Bowdle area. This region signaled the best convergence along the warm front and figured if anything would pop, it would be this area. We passed a large group of storm chasers and saw the TIV 2 waiting for storms to develop. Shannon and I stopped on a dirt road and watched these towers slowly rise up through the cap. Another synoptic feature of interest was the dryline that was bulging into our area from the southwest. The dryline, cold front and warm front represented a triple point set up. The cap eroded enough for one updraft to punch through and explode. Instantly, a tornado warning was issued. We left the town of Gettysburg, South Dakota and traveled north on highway 47|20 and saw the supercell structure to our northwest. It had already developed a lowering and a nice defined beaver tail. I found an open area to sit and watch the wall cloud develop. Eventually the surface inflow became strong from the east as the wall cloud became more organized. Storm chasers pulled up behind us to watch this feature. Shortly after, a small funnel was visible to our west as the rear flank downdraft (RFD) wrapped itself around the mesocyclone. The funnel dissipated, but as the RFD wrapped around the mesocyclone even further, the first tornado developed northwest of our location. It lifted after 5 minutes to yet again drop another brief tornado to our northeast toward Bowdle. We traveled north along highway 47 and saw the TIV 2 pass us going south and figured the road was blocked due to power lines which was the case. We turned around and found a dirt road to take us east. The twister came into view and it had become a massive wedge tornado to our northeast near Bowdle, South Dakota. It soon became wrapped in rain and we were able to find a paved highway to travel towards it. The Bowdle wedge dissipated however a new tornado had formed to our north and lasted for about 10 minutes. The tornado had an elephant trunk shape and swirled about in a field. The supercell started to change its characteristics into more of a high precipitation supercell. These are the type of supercells that are hard to chase due to rain wrapped tornadoes and it's visually hard to see any features in and around the storm. Ambulances rushed west towards Bowdle and we figured the small town was hit in some areas, but it appeared it was mostly spared. We continued east and then settled north of Roscoe, South Dakota to watch the wall cloud to our west. The storm appeared to be reorganizing and it felt like the mesocyclone was ready to drop down another tornado. The inflow into the wall cloud was blowing due south, strengthening as each minute passed. At this moment, we were in a hairy situation. We couldn't escape north due to the risk of large hail. Our west option was dangerous due to muddy dirt roads and east option was hazardous because we would be following with the mesocyclone. South option was out, because we would drive into it. The inflow became so strong and the wall cloud appeared to have lowered very close to the ground as it looked like a tornado was about to drop in a field to our southeast. The Dominator 2 pulled up next to us to strategize their next move just like us. We drove west a bit to try to get out of the way and let the storm pass while the Dominator 2 went east and got stuck in the mud. We eventually turned around and got back on highway 12 and followed the storm from behind. We made one last attempt to follow the storm on highway 12 from Roscoe to Ipswich, South Dakota. We drove into the outer fringes of the hook echo and the tornadic circulation was off to our northeast. As we became closer to Ipswich, the winds picked up tremendously. They were blowing from northwest to southeast. We either became too close to the tornadic circulation or the rear flank downdraft (RFD) was wrapping itself around the supercell thunderstorm. We took refuge at a gas station with many storm chasers taking cover to protect their vehicles. Soon, hail began to fall on the truck and hoped for the best until things would pass. The RFD was very strong for 15 minutes with winds sustained near 50 to 65 mph. The storm moved east and we traveled back and spent the night in Pierre, South Dakota. Bowdle was able to escape most of the damage, but some farms and transmission lines were destroyed. Overall, it was an incredible chase to remember.